MLB hired umpires Adam Hamari, Pat Hoberg, Gabe Morales & Carlos Torres to the full-time staff, according to a source. * Since their respective MLB debuts as Triple-A call-up umpires, the foursome has a combined 1,364 games of big league experience going into the 2017 regular season, with Hamari the most experienced and Torres the least. As reported in 2016, retirements include Bob Davidson, John Hirschbeck, and Tim Welke. Adam Hamari: With 461 of Major League experience over four seasons (2013-16), Marquette, Michigan native Adam Curtis Hamari joins the big league staff as the most experienced member of the 2016 Call-Up staff. After graduating from the Jim Evans Academy of Professional Umpiring (JEAPU) in 2006, Hamari worked the New York-Penn, Midwest, California, Florida State, Southern, Eastern, International, and Pacific Coast Leagues. He also officiated the 2011 Arizona Fall League. Hamari won the 2016 UEFL Fill-In Umpire of the Year award and is fellow MLBU Cory Blaser's brother-in-law. > Age on Opening Day 2017: 33 (5/25/1983). > MLB Debut: June 26, 2013 (CHC-MIL; -cc Kellogg). > First MLB Ejection: March 8, 2014 (Bob Melvin). > Notable: Called Tim Lincecum's no-hitter on June 25, 2014. > Most Recent MLB Ejection: Sept 23, 2016 (Kemp/Snitker). Gabe Morales: Santa Clara, California-born Gabriel Morales joins the big league staff with 389 games of MLB experience, which is third as of the 2016-17 offseason, behind fellow hire Hamari (461) and call-up Clint Fagan (453). Morales is a 2009 graduate of the Jim Evans Academy of Professional Umpiring (JEAPU), and since has officiated the Arizona, New York-Penn, South Atlantic, Arizona Instructional, Texas, International, and Pacific Coast Leagues, in addition to the 2013 Arizona Fall League and XM All-Star Futures Game. 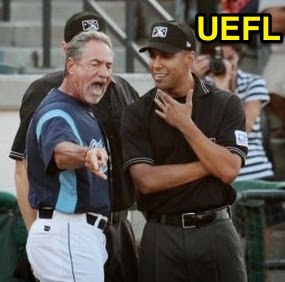 Morales finished third in the 2016 UEFL Fill-In Umpire of the Year award vote. > Age on Opening Day 2017: 32 (6/21/1984). > MLB Debut: April 2, 2014 (CLE-OAK; -cc Winters). > First MLB Ejection: August 23, 2015 (Paul Molitor). > Most Recent MLB Ejection: July 31, 2016 (John Farrell). Pat Hoberg: With a birthdate of September 11, 1986, Patrick Hoberg is the youngest hire (30 years old), and also has the most big league ejections to his name (11). Born in Des Moines, Iowa (think: Tim McClelland and Eric Cooper, and tangentially Mike Everitt and Mike Reilly), Hoberg is the third new hire to have graduated from the Evans Academy, and was in Morales' 2009 class at the school. Hoberg has worked the Arizona, Appalachian, Florida State, Texas, and Pacific Coast Leagues, additionally joining Morales on the 2013 AFL and XM Futures Game staffs. After Hoberg ejected disgruntled minor league manager Mark Haley in 2011, Haley ominously predicted, "it's going to be a long ways to go before [Hoberg] reaches his goal." Consider that goal reached. 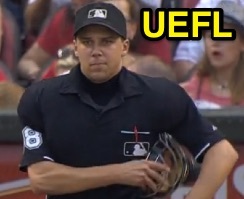 Hoberg finished second in the 2016 UEFL Fill-In Umpire of the Year award vote. > Age on Opening Day 2017: 30 (9/11/1986). > MLB Debut: March 31, 2014 (SF-ARI; -cc Hallion). > First MLB Ejection: May 28, 2014 (Elvis Andrus). > Notable: Called Jake Arrieta's no-hitter on Aug 30, 2015. > Most Recent MLB Ejection: September 20, 2016 (Mike Scioscia). 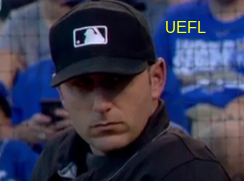 Carlos Torres: The eldest (38 years old) and only foreign-born umpire in MLB's Class of 2017, Venezuela's Carlos Torres Nuldis (born in Barquisimeto, Lara) officiated the most big league games in 2016 of any single MLB or MiLB umpire, save for Ryan Blakney (Torres officiated 141 games; Blakney called 142), yet has worked cumulatively fewer games than the other three hires. Unlike the others, however, Torres has more consistent experience working his native Venezuelan League, one of baseball's Winter Leagues. Like Morales and Hoberg, Torres has been a Minor League umpire since graduating from Evans' Academy in 2009 and worked the Gulf Coast, New York-Penn, South Atlantic, Carolina, Southern, Arizona Fall, and International Leagues. 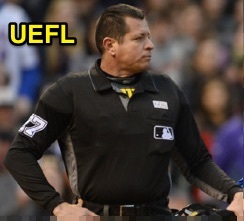 He is the second Venezuelan to umpire a Major League game (Manny Gonzalez). > Age on Opening Day 2017: 38 (9/14/1978). > MLB Debut: July 17, 2015 (CLE-CIN; -cc Kellogg). > First MLB Ejection: May 14, 2016 (Terry Collins). > Most Recent MLB Ejection: Sept 10, 2016 (Hernan Perez). 1) Adam Hamari - 461 Games (48 in 2013, 127 in 2014, 154 in 2015, 132 in 2016). 2) Clint Fagan - 453 Games (5 in 2011, 16 in 2012, 69 in 2013, 119 in 2014, 131 in 2015, 113 in 2016). 3) Gabe Morales - 389 Games (123 in 2014, 135 in 2015, 131 in 2016). 4) Pat Hoberg - 354 Games (123 in 2014, 92 in 2015, 139 in 2016). 5) Toby Basner - 323 Games (19 in 2012, 17 in 2013, 106 in 2014, 93 in 2015, 88 in 2016). 6) Chris Segal - 248 Games (111 in 2014, 116 in 2015, 21 in 2016). 7) Ryan Blakney - 230 Games (88 in 2015, 142 in 2016). 8) Sean Barber - 217 Games (92 in 2014, 58 in 2015, 67 in 2016). 9) Tom Woodring - 192 Games (102 in 2014, 54 in 2015, 36 in 2016). 10) Ben May - 187 Games (30 in 2014, 88 in 2015, 69 in 2016). 11) Carlos Torres - 160 Games (19 in 2015, 141 in 2016). 12) Nic Lentz - 105 Games (105 in 2016). 13) Stu Scheurwater - 100 Games (24 in 2014, 23 in 2015, 53 in 2016). *Refer to the UEFL's Best Practices for more information on news reporting from a source.